When you live in a place long enough, perhaps you, too might start to set your watch by an intimate knowledge of when your favorite dessert is made. 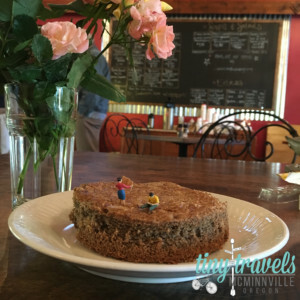 It’s been the same every place we’ve lived since my husband and I got married, but we weren’t sure it was going to happen for us in McMinnville. We’ve marked our calendars by chocolate mousse cups – flaky pie base, finger-width layer of chocolate ganache with a tiny mountain of piped chocolate mousse on top, or Later, a bakery’s DIY cannoli kit – mascarpone custard piping bag with a caramelized shell. We had been in McMinnville for four years without falling in love with any one sweet confection, but about a year ago my husband brought home one flaky round, dusty brown disc about five inches in diameter from Red Fox Bakery. And soon, he was biking three miles into town on his lunch break every Thursday to pick up a buckwheat cake (or two, or five). It’s been the same every week since. I wait for it, actually. There’s a moment mid-day where I get the call, declaring the firm gladatorial Yay or Nay. Really, I don’t care if you slap “French” on it and sprinkle it with Fleur de sel like they do at Red Fox, is there anything more ‘Merica than a buckwheat cake? A pastry so connected to the longings of the wayward traveler yearning to be home that it made it into a line of Stephen Foster’s minstrel ballad “Oh Susanna,” at the very point when the singer is dreaming of his long lost love? That’s not even to get started on buckwheat itself. As a crop, it doesn’t respond to nitrogen fertilizers or pesticide use, so cultivation had fallen off in the last century, but a new consumer interest in ancient grains – heirloom grains that haven’t changed much in the past hundred years – has led bakers and recipe developers to experiment more with it as an ingredient. The result has been a bevy of baked goods with that quintessential buckwheat toothiness that somehow manages to feel both light and substantial at the same time. At Red Fox, the Hall and Oates Channel streaming in on Pandora mixing with the scent of yeast starter, Baker Warren Lambert makes no more than a double batch of buckwheat cakes each Monday and Thursday at about 3:30 a.m., using a secret recipe developed by the bakery’s original owners. Count them – that’s 24, including one that they usually cut up for samples. With the sun still far from rising, Lambert mixes the dry ingredients into a mixture of butter, vanilla, eggs and sugar, mixing them just long enough until incorporated. Any more and the cakes will be more hockey puck than flaky disc. The goal? An inch-high, lightly vanilla-sweet cake tinged with the unmistakably robust, slightly hoppy buckwheat. He bakes them at 375 degrees on a tray sandwiched between the bakery’s other products, cinnamon rolls and twice-baked almond croissants. Later, he will turn to danishes, fruit gallettes and, of course, baguettes, some of which will end up on a signature red wagon dragged down Third Street to restaurant clients. A double tray of buckwheat cakes is all here can manage in between so much else, no more, no less. What can I say – it’s a problem. On a good day, half a dozen can make it to the bakery’s stand at the McMinnville Downtown Farmer’s Market. But all you need is one crazed buckwheat superfan who rolls in at 7:15 am and buys the whole lot and the day is soured for the rest of us. Will there, or will there not be buckwheat cakes at Red Fox today? Red Fox plays this game of scarcity, trying to never over-saturate the market and leaving people wanting more. It’s a small batch bakery after all, with everything hand-made and where the goal is to have products sell out, but it’s a delicate dance where getting used to the occasional grumpy sullen customer is part and parcel to retaining a product’s popularity. Meanwhile, at my house, we’ve got scarcity’s opposite and opposing force going full throttle: Food as love language, the desire to share an abundance of the things you adore with your own adorables because you like watching your sons and friends and partner’s colleague’s husband crumble, too. Check in with me in a week, please. Sharing this information might have been the worst idea for a writing subject I’ve ever had. Emily Grosvenor is a magazine writer in McMinnville. Follow her on Twitter @emilygrosvenor.